I'm using the Longman complete course for the TOEFL test and even though the skills are very good I hate that the instructions call for some elements to be identified and determine if the sentence is correct or incorrect, the answers only tell you the last part so I have no way of knowing if I identified all the elements correctly. The computer programmer was unaware that there was so many mistakes in the program he had written. 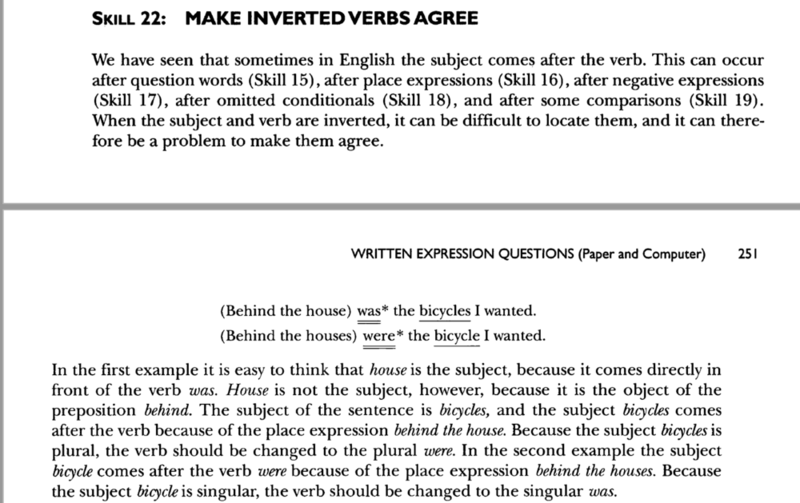 I selected the second "was" as my verb and "mistakes" as my subject. The correct sentence should be "were so many mistakes", therefore the sentence is incorrect. I cannot find which category the sentence fits. I'm attaching the skill, please let me know if you need all the other skills mentioned in the first paragraph. Hi, Misssalinas: There is no inversion in that sentence. 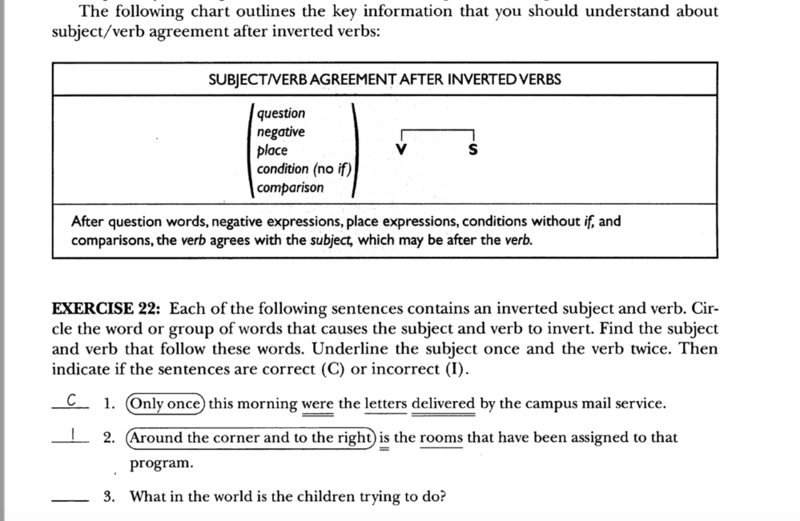 The clause "there was were so many mistakes in the program he had written" is a sentence like "There is no inversion in that sentence," which also doesn't contain inversion. 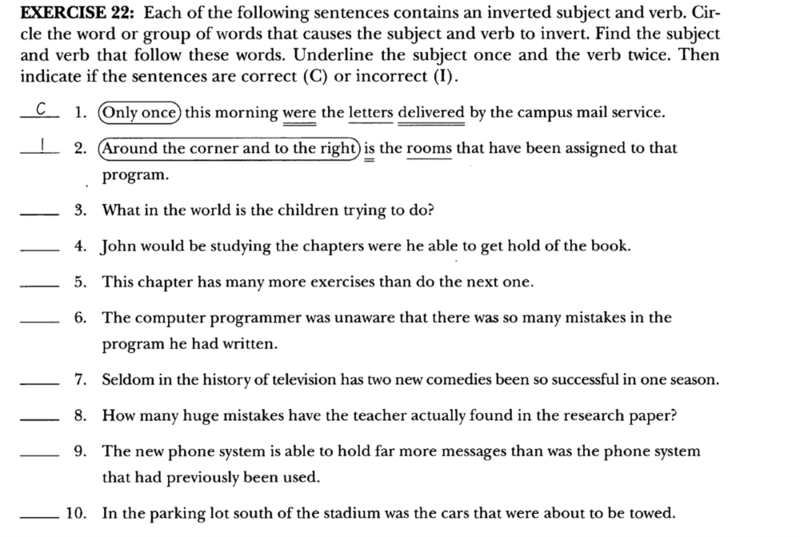 Perhaps the test makers who made that question have a weak or imprecise understanding of English grammar. These types of clauses use expletive or existential "there," in which "there" functions as the grammatical subject of the clause. The logical, semantic subject appears later in such clauses, and it is the logical subject that governs subject-verb agreement . 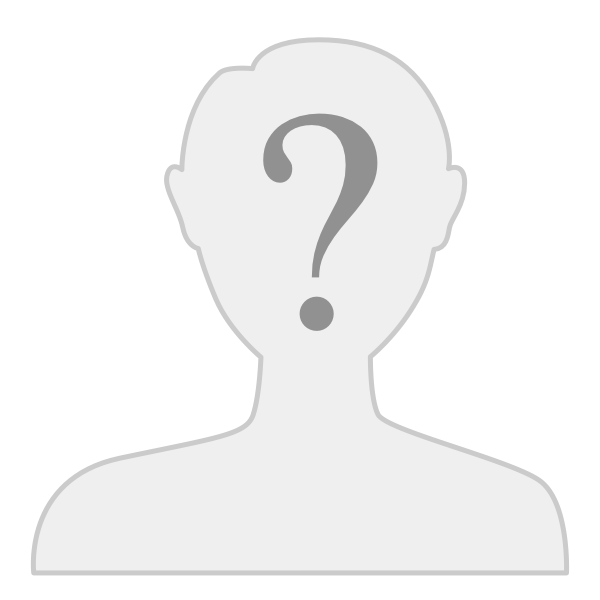 In "There was somebody speaking which derives from "Somebody was speaking," "somebody" is the subject (singular). In "There were people speaking," on the other hand, which derives from "People were speaking," the logical subject is "people" (plural), so the verb must also be plural. The following are ungrammatical: *"There were somebody speaking"; *"There was people speaking." Again, the grammatical subject is "there," which is an empty placeholder, devoid of meaning. Thank you for the explanation, David. At first I fast read it and didn't get all the information you added but I once I read it again it all made sense and I understood what you mean when you said that there was no inversion in the sentence. The book is a preparation to take the test that will give you a score on your English knowledge. It's one of the standards that a lot of companies here requests, and you need to get a high score to be considered to be hired. This is why I would have thought that the book presents a good English knowledge and what you told me, just surprised me. I'm still working with that book and will keep posting my questions.